Most of us get to walk around on stage with our own hair showing, but if your hair is too short or too pink, you have to wear a wig. 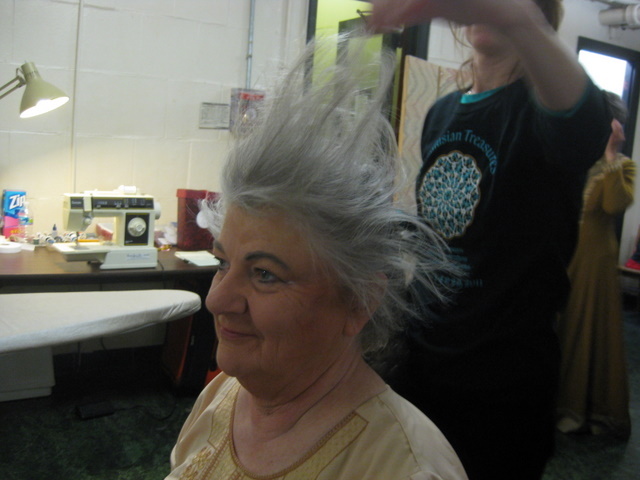 Yesterday Jane Bloodworth, alto section leader and all-around awesome person, was kind enough to let me take pictures of having her wig put on with the help of volunteer Barbara Brodie. Jane’s hair is pinned down in the back, but nice and floofy in front. 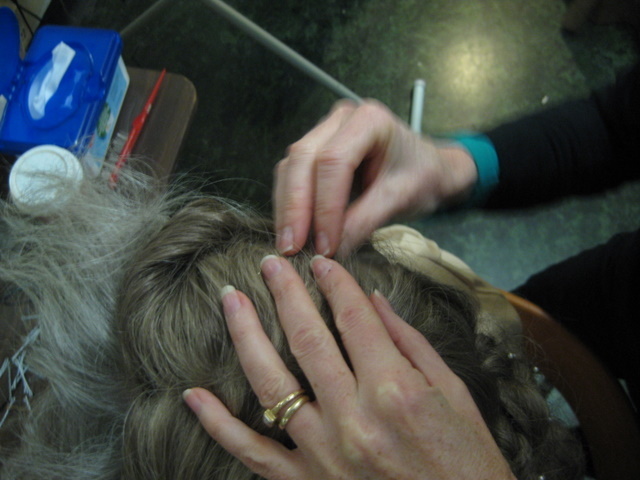 That’s because the front of her hair will be combed over the front of the wig to make it look more natural. When we do the show over and over, first in practice, then in performance, we start to notice who we run into as we move around the stage during the show. There are some people I never see – I have exactly one chance to stop and chat with my friend Autumn Wilson, and a moment near the beginning where I say hi to Will Wurzel. Otherwise I hardly see either of them. But there are at least three points in the show where I look behind me and see Jane. I like knowing that, at any point, this smiling face could appear behind me. Truly, is there such a thing as hair that’s TOO pink? Never too pink….Oops, gotta run so I can get that wonderful wig on again! From out front, Jane Bloodworth is regal & gorgeous this year – the veil draped in front frames her face just so, and the colors are perfect for her. And I love her turn as one of the Magi!! Love this! i was lucky enough to be in the front row with my family on the 9th, and Jane is the one who held my hand during “Lord of the Dance”! So fun! 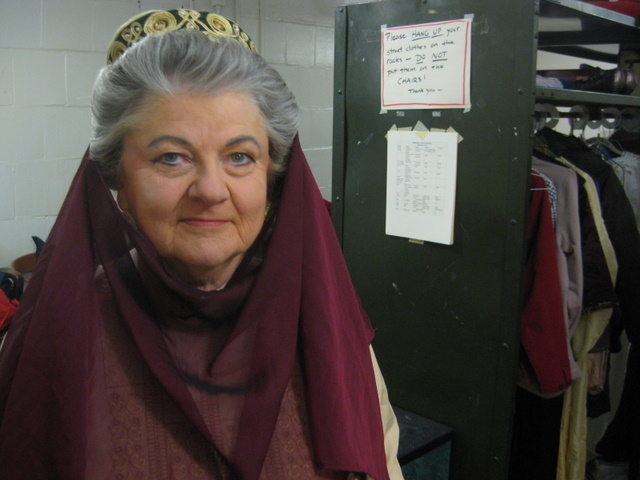 Yes, Jane, was representing for the Silver Foxes during this show–so regal, so glorious, and that gorgeous voice!